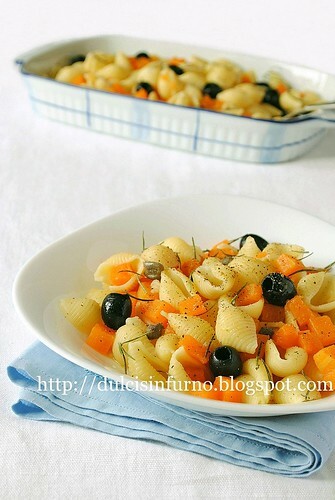 Serves: 4 personeDifficolta ': Easy Preparation time: 45 minutes INGREDIENTS 350g. paccheri 500gr. Pumpkin 150gr. 200g of black olives. tomato sauce 2 onions 1 clove garlic 1 / 2 cup dry white wine basil 5 tablespoons olive oil salt pepper ----------------------- --- PROCEEDINGS Peel the pumpkin by removing the skin, seeds and stringy portion, cut the flesh into cubes. Peel onions and chop finely. In a large pan heat oil and brown the crushed garlic clove and the chopped onions. Add the diced squash and cook for 5 minutes, stirring a wooden spoon. Season the squash with basil with your hands and the tomato sauce. Add salt and pepper, pour the wine and simmer the sauce for 20 minutes on medium heat. In a saucepan, bring plenty of water to a boil and boil, add salt. Dive paccheri and cook until al dente. Drain and rovesciateli in the pan with the sauce. Add the olives and mix thoroughly. Pepper, flavored with basil and other serve immediately.